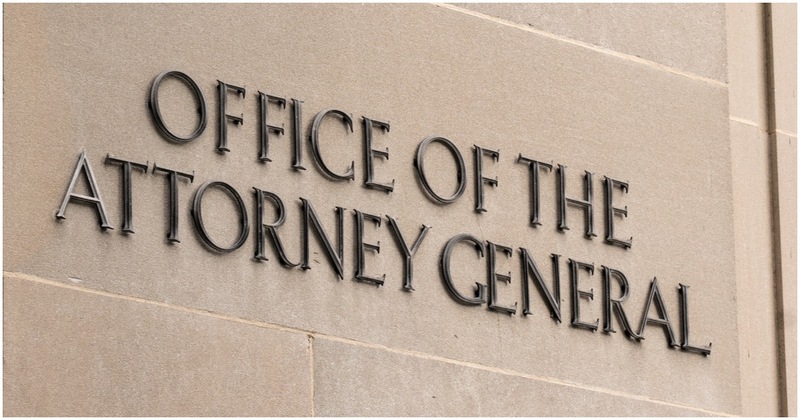 When Attorney General Jeff Sessions resigned the day after the midterm elections, Deputy AG Rod Rosenstein was passed over for the job. The acting AG is Matthew Whittaker, Sessions’ chief of staff. How about former Republican New Jersey Governor Chris Christie? With Jeff Sessions resigning as President Trump’s Attorney General, reports are now circulating that former New Jersey Gov. Chris Christie is in the running to take his place. According to CBS News, two sources close to the president confirmed that Chris Christie, one of President Trump’s early supporters, is on the short list of potentials to replace Jeff Sessions, who announced his resignation just one day after the midterm elections where Democrats took back the U.S. House. If not Christie, how about a woman with ties to Supreme Court Justice Brett Kavanaugh? President Trump is considering a retired federal appeals court judge who also served on the California Supreme Court as the next U.S. attorney general following the Wednesday resignation of Jeff Sessions, according to reports. Janice Rogers Brown, who is African-American and well-liked in conservative circles, served alongside Supreme Court Justice Brett Kavanaugh and spoke to the White House about the job in recent weeks, the Sacramento Bee reported. Democrats will have a field day if Trump chooses Brown. They’ll find a way to make it a big issue. Others being considered for AG? -Kansas Secretary of State Kris Kobach (who just lost his bid for governor). -Retiring Florida Attorney General Pam Bondi. -Health and Human Services Secretary Alex Azar. -Former Attorney General William P. Barr. -Trump personal attorney (and former NYC Mayor) Rudy Giuliani. When women make up stories of sexual assault in order to destroy the lives of men with whom they disagree, all they’re doing is hurting the arguments for women who have actually been abused. Take this woman, for example. She accused then-SCOTUS nominee Brett Kavanaugh of sexual assault. She now admits she made up the whole story because she didn’t want Kavanaugh to become a Supreme Court justice. 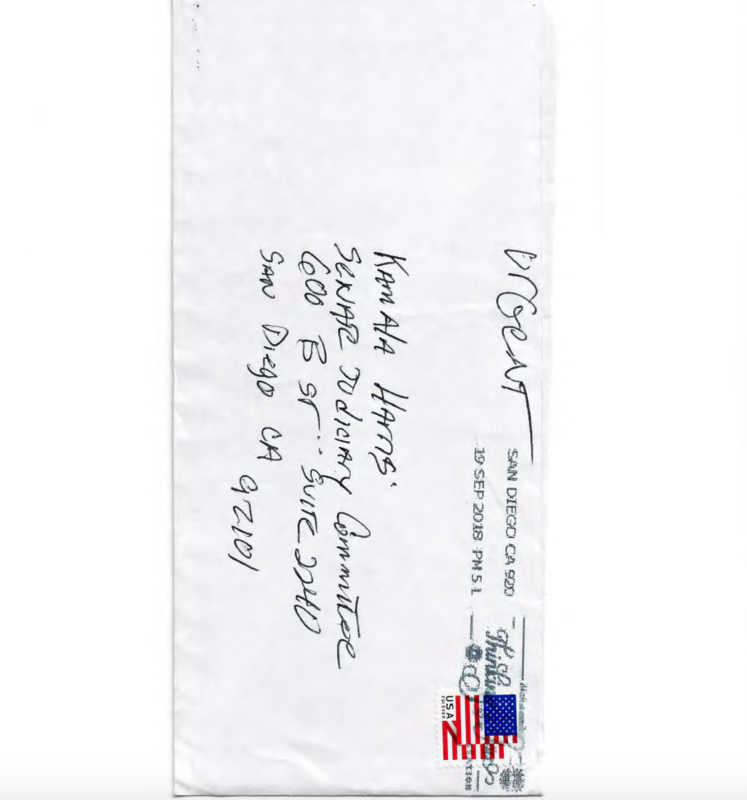 On September 25, 2018, staffers for Senator Harris, a Committee member, referred an undated handwritten letter to Committee investigators that her California office had received signed under the alias “Jane Doe” from Oceanside, California. 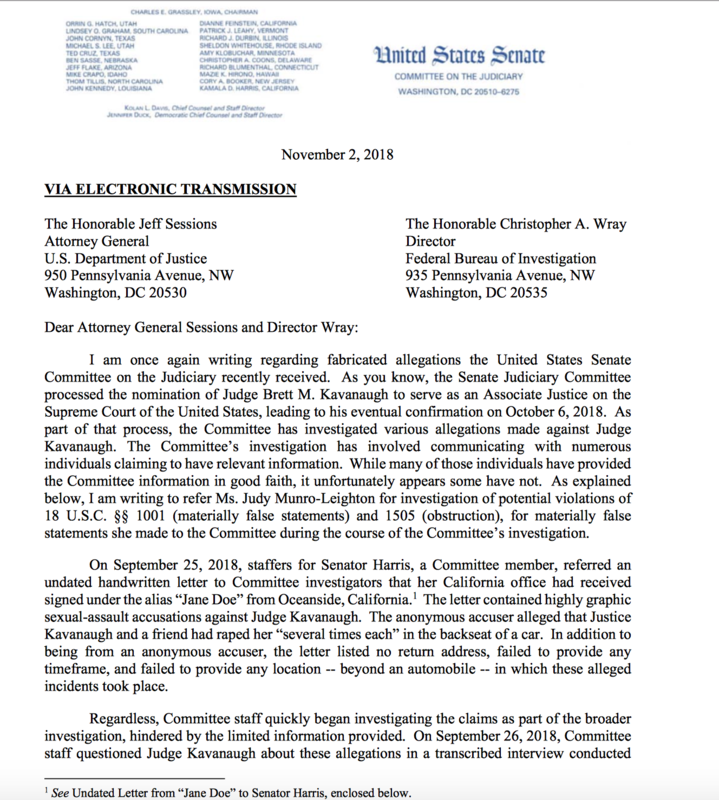 The letter contained highly graphic sexual-assault accusations against Judge Kavanaugh. The anonymous accuser alleged that Justice Kavanaugh and a friend had raped her “several times each” in the backseat of a car. 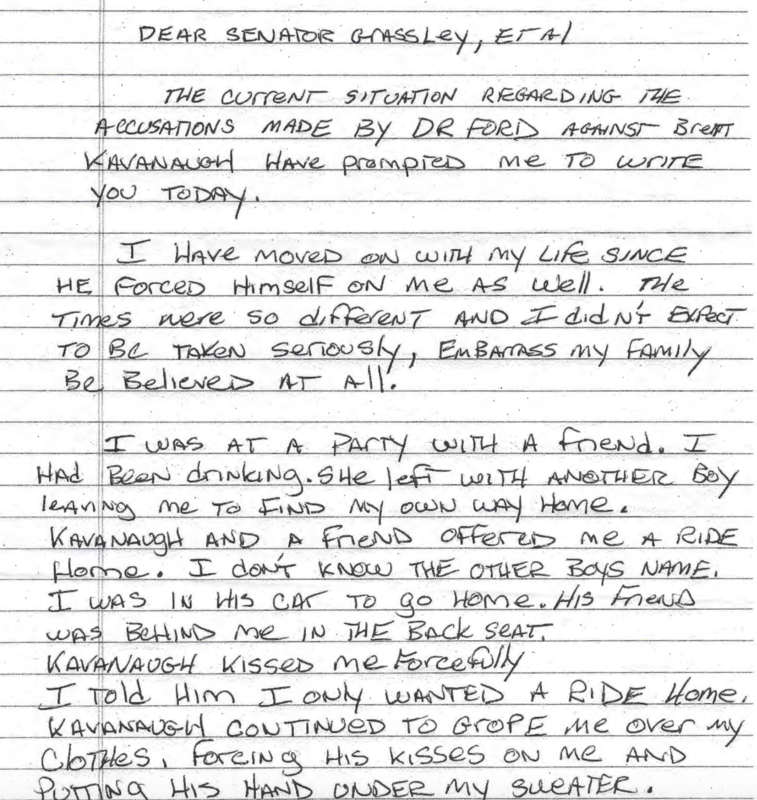 In addition to being from an anonymous accuser, the letter listed no return address, failed to provide any timeframe, and failed to provide any location — beyond an automobile — in which these alleged incidents took place. Committee investigators began investigating Ms. Munro-Leighton’s allegations. Given her relatively unique name, Committee investigators were able to use open-source research to locate Ms. Munro-Leighton and determine that she: (1) is a left-wing activist; (2) is decades older than Judge Kavanaugh; and (3) lives in neither the Washington DC area nor California, but in Kentucky. 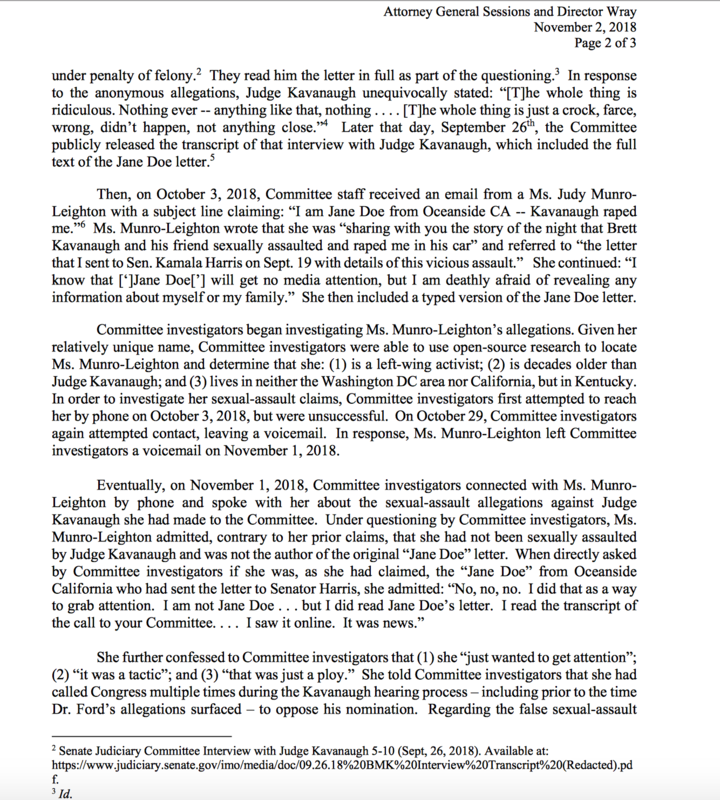 In short, during the Committee’s time-sensitive investigation of allegations against Judge Kavanaugh, Ms. Munro-Leighton submitted a fabricated allegation, which diverted Committee resources. 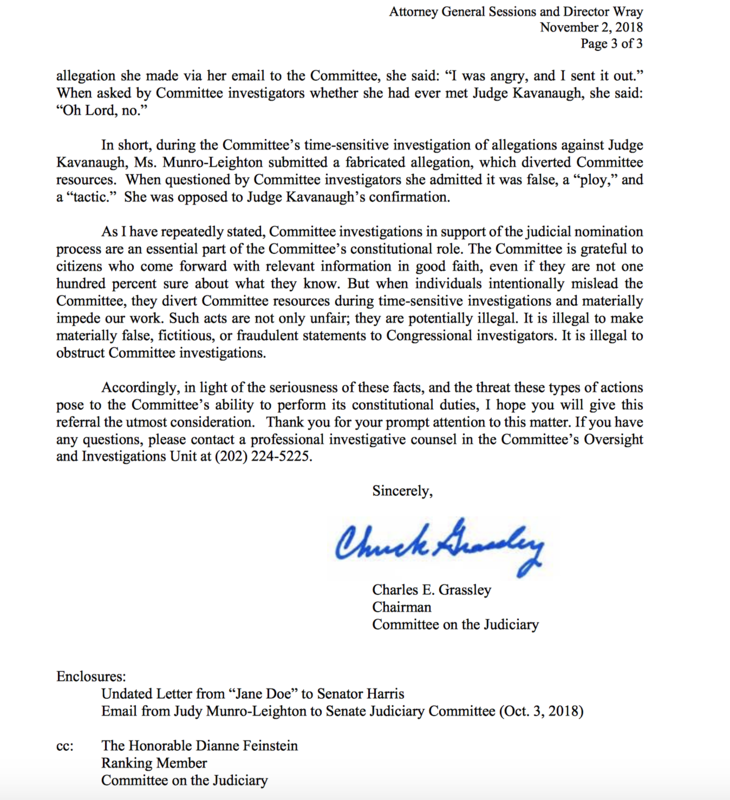 When questioned by Committee investigators she admitted it was false, a “ploy,” and a “tactic.” She was opposed to Judge Kavanaugh’s confirmation.